It is easy to think that hardwood is stronger than softwood because of their names. However, the terms “hardwood” and “softwood” describe a tree’s structure and what tree species it comes from, not its density. Used for construction, furniture, flooring, etc. Used in paper production, floorboards, etc. 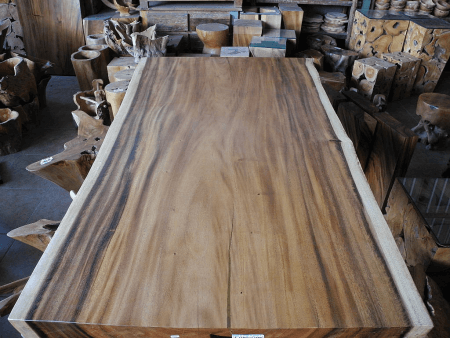 Many tabletops are made from hardwood because of its durability. Hardwood is wood from a diverse family of trees that sheds leaves (abscission) and grows them back, usually in the fall and spring respectively. It also comes from evergreen trees that do not shed their broad leaves at all. These two types of trees belong to the flowering plants group, or angiosperms. Hardwood trees have about a hundred times more species than softwoods. They are so diverse that some types (i.e. balsa wood) are actually softer than softwood. Hardwood such as oak usually has annual growth rings, unlike tropical hardwoods. Hardwoods have pores or vessels that vary in size. Hardwood is very durable and has a wide variety of applications including construction, furniture, floorboards, fuel, cooking, and boat building. Common examples of hardwood trees include beech, mahogany, oak, hickory, walnut, and teak. 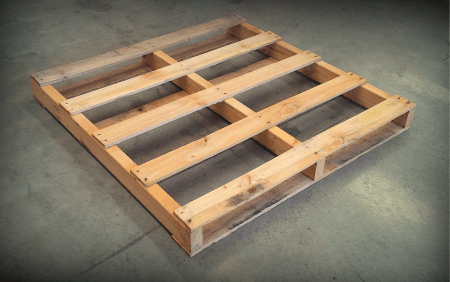 A standard wood pallet is made from softwood. Softwood comes from a group of seed producing plants called gymnosperms (uncovered seeds). Softwoods such as pine, cedar, and spruce have exposed seeds that are blown away to germinate. Softwood makes up 80% of the world’s demand for timber. The Baltic regions, China, and North America are major traditional suppliers of softwood. Softwoods feature tracheids, or straight, linear tubes that transport water and helps in the production of sap that nourishes the stem. Softwood is very pliant and inexpensive to use. It is commonly used to produce paper, fiberboard, timber, and as a hardwood substitute where it is applicable. So what’s the difference between hardwood and softwood? The main difference comes from the tree’s origin – hardwoods come from angiosperm plants (enclosed seed) while softwood comes from gymnosperms (uncovered seeds). Hardwood has pores of various sizes and shapes that allow water to nourish the tree. These pores determine the grain pattern and help in making the wood more dense and fire resistant. Softwood nourishes itself with the help of its tracheids. These linear tubes bring water and aid in sap production. While hardwood is typically used for its density and durability in construction, softwood is mainly used for paper production, floorboards, and timber. Check out this interesting YouTube video highlighting the differences between the two.